I play a lot of PbtA games these days, so when I’m eyeing new dice I’m generally thinking about pairs of six-siders. And I’m a sucker for pretty dice. 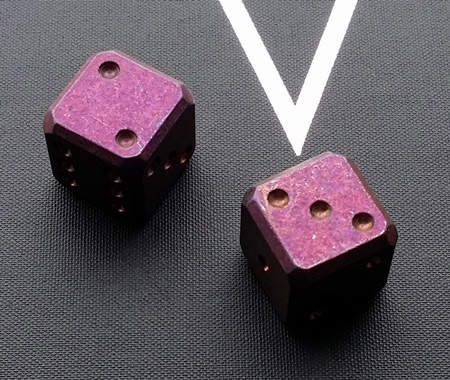 They’re also larger than standard gaming d6s, 3/4″ vs. 5/8″, like casino dice. 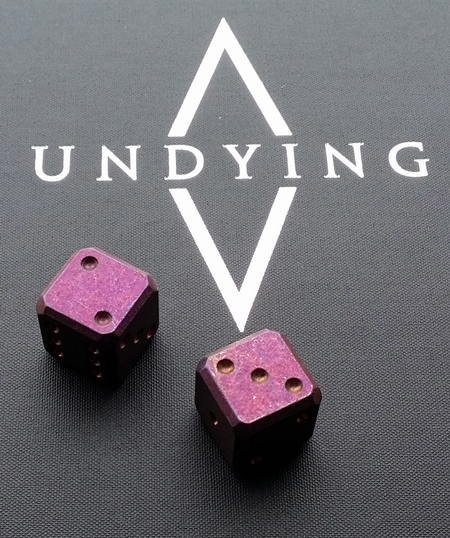 I love the anodization, which is deliberately “uneven” — they have an antiqued look, and with time (and rolls) they’ll scuff and develop a character all their own. With respect to fairness, they should be as fair as any other machine-made, tumbled, pipped dice. If Flytanium drilled the pips to different depths based on face (shallowest on the six face, deepest on the one face), that would make them more accurate. But they don’t, and that’s fine by me. I’m generally not a fan of oversized dice, but these are so well chamfered that they feel great in-hand — and they roll well. Unlike precision-edge and non-titanium metal dice I own, these aren’t table-destroyers. I’d roll them on most tables without too much concern, though I’d still prefer a pad, book, or dice tray, because heavy dice are noisy. I strongly suspect, however, that they would be dice-destroyers. When I used to carry metal dice and plastic dice in the same bag, the plastic ones showed wear pretty quickly. Gamescience dice, with their light, crisp edges, went first; after a week, they looked like they’d been through a war. So I’ll be carrying these on their own, not with their plastic buddies. I wasn’t sure how readable these suckers would be without contrasting pips — they’re anodized all over. Only real table time will tell for sure, but the pips, which are generally shiny, stand out well against the stonewashed surface. I experimented with rolling them under different light conditions, and only when the light was so dim that I wouldn’t want to game in a room that dark did they become difficult for me to read — and even then, only at arm’s length. Closer in, or in normal light, they’re surprisingly readable. 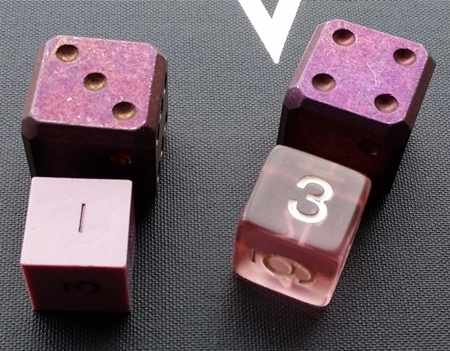 Flytanium makes d6s in a variety of materials and colors, often in short runs. As of this writing, their website is sold out, but you can find them in other places. (I got mine on Ebay; BladeHQ also carries them, as do other knife- and EDC-oriented sites). I’ve seen photos of a titanium version with anodized pips and non-anodized flats, and those pips practically glow. I’m going to keep an eye out for a pair of those, just in case some table time reveals that the all-over-anodized versions are harder to read than I think they will be. And fun weird dice, and old-school dice, and . . .
 They’ve also done some that literally glow, thanks to embedded tritium vials. Hmm, not sure about the readability. Most GMs I game with prefer one to use dice *they* can read too, from across the length of the table. But then, I’m not a fan of metal dice, and if someone tried to roll them on a table of mine they’d be told off in no short order no matter how light the dice or unsharp the edges were. In all fairness, I’m the same way with oversized dice too. If you want to roll them in a tray or on a book, fair enough, but my Chessex mat got dinged good by someone rolling large, sharp D6s on it. I haven’t thought about anyone else checking my rolls (or vice versa) for many years — definitely a thing at some tables, though. I think it becomes an issue when a run of great rolls happens and the glee of the roller has the taint of sneering in it. Some gamers project a mental age more like their shoe size. Dice with custom pips can cause trouble because sometimes the Elder Sign is on the “six” face and sometimes the Grinning Skulls are on the “one” face. It has been a long time since I, as a GM, cared what a player’s roll *really* was, but if I’m rolling in the clear so that everyone can see I expect the players to do so too. I have to admit I’m intrigued by these metal dice now.